Exercising is a beautiful gift to yourself. I know it doesn’t always seem that way and it just seems easier not to do it sometimes, but like all good things in life, it’s a discipline. And a little discipline can go a long way. If you want hard evidence that people who are active age better, just look at how athletes and dancers age. The glorious Darcey Bussell for example. And what about Torvill and Dean?? Thirty years after their heyday they barely look a day older. But why is exercise so beneficial? 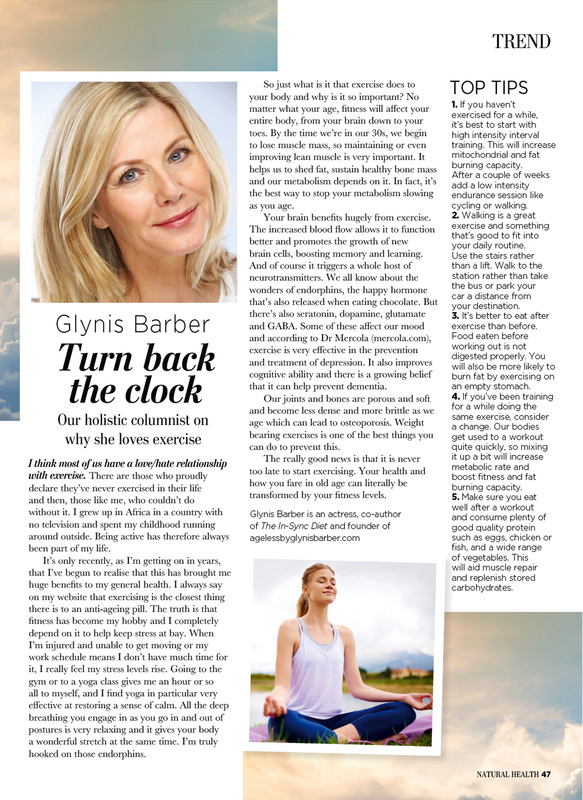 In my latest column for Natural Health I take a look and you may be surprised at just how beneficial it is. I think most of us have a love/hate relationship with exercise. There are those who proudly declare they’ve never exercised in their life and then, those like me, who couldn’t do without it. I grew up in Africa in a country with no television and spent my childhood running around outside. Being active has therefore always been part of my life. It’s only recently, as I’m getting on in years, that I’ve begun to realise that this has brought me huge benefits to my general health. I always say on my website that exercising is the closest thing there is to an anti-ageing pill. The truth is that fitness has become my hobby and I completely depend on it to help keep stress at bay. When I’m injured and unable to get moving or my work schedule means I don’t have much time for it, I really feel my stress levels rise. Going to the gym or to a yoga class gives me an hour or so all to myself, and I find yoga in particular very effective at restoring a sense of calm. 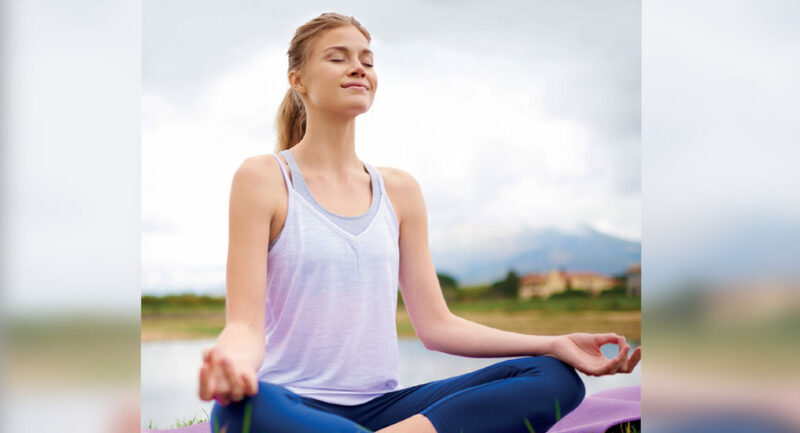 All the deep breathing you engage in as you go in and out of postures is very relaxing and it gives your body a wonderful stretch at the same time. I’m truly hooked on those endorphins. So just what is it that exercise does to your body and why is it so important? No matter what your age, fitness will affect your entire body, from your brain down to your toes. By the time we’re in our 30s, we begin to lose muscle mass, so maintaining or even improving lean muscle is very important. It helps us to shed fat, sustain healthy bone mass and our metabolism depends on it. In fact, it’s the best way to stop your metabolism slowing as you age. Your brain benefits hugely from exercise. The increased blood flow allows it to function better and promotes the growth of new brain cells, boosting memory and learning. And of course it triggers a whole host of neurotransmitters. We all know about the wonders of endorphins, the happy hormone that’s also released when eating chocolate. But there’s also seratonin, dopamine, glutamate and GABA. Some of these affect our mood and according to Dr Mercola, exercise is very effective in the prevention and treatment of depression. It also improves cognitive ability and there is a growing belief that it can help prevent dementia. Our joints and bones are porous and soft and become less dense and more brittle as we age which can lead to osteoporosis. Weight bearing exercise is one of the best things you can do to prevent this. The really good news is that it is never too late to start exercising. Your health and how you fare in old age can literally be transformed by your fitness levels. If you haven’t exercised for a while, it’s best to start with high intensity interval training. This will increase mitochondrial and fat burning capacity. After a couple of weeks add a low intensity endurance session like cycling or walking. Walking is a great exercise and something that’s good to fit into your daily routine. Use the stairs rather than a lift. Walk to the station rather than take the bus or park your car a distance from your destination. It’s better to eat after exercise than before. Food eaten before working out is not digested properly. You will also be more likely to burn fat by exercising on an empty stomach. If you’ve been training for a while doing the same exercise, consider a change. Our bodies get used to a workout quite quickly, so mixing it up a bit will increase metabolic rate and boost fitness and fat burning capacity. Make sure you eat well after a workout and consume plenty of good quality protein such as eggs, chicken or fish, and a wide range of vegetables. This will aid muscle repair and replenish stored carbohydrates. Have you heard of ncn skincare from website treat the skin your in.I wanted to order some of their prodcuts. Have you tried these.They sound very good.?? I haven’t heard of these but they sound very interesting. If you do use them be sure to let me know what you think?